This page focuses on the project results. If you are looking for details of PyMood usage please refer to our Lactococcus project example. 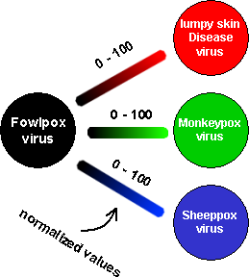 Fowlpox encoded proteins were compared with lumpy skin disease virus, monkeypox virus, and sheep pox virus proteins using the PyMood program. Fowlpox specific proteins, as well as the proteins shared between all four genomes have been identified. PyMood BLAST Launcher was used to perform all blastp runs. The entire project was done in 15 minutes on a laptop computer. Out of 261 fowlpox proteins, 109 could not find homologs in the target databases (e > -8). 103 fowlpox proteins have equally distant homologs in the other three viruses. 53 fowlpox proteins have very similar homologs (e<= -50) in all three other viruses.